Can control two strings 800+ WS2811 pixels with fused and buffered outputs. Dedicated RS-485 DMX Output (Renard, DMX, LOR selectable). Input voltage 5, or 7-24V selectable. Real time clock (RTC). Completely Assembled. 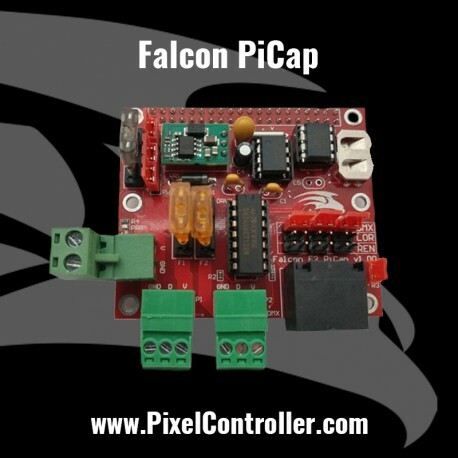 50% of of proceeds from sales of the Falcon PiCap will go to FPP development team. All support for this product is through FalconChristmas.com user forums. Can control two strings 800+ WS2811 pixels with fused and buffered outputs. Dedicated RS-485 DMX Output (Renard, DMX, LOR selectable). Input voltage 5, or 7-24V selectable. Real time clock (RTC). Completely Assembled. The PiCap support PI B+, PI 2, PI 3 and PI Zero. It does not support the PI B (Original).